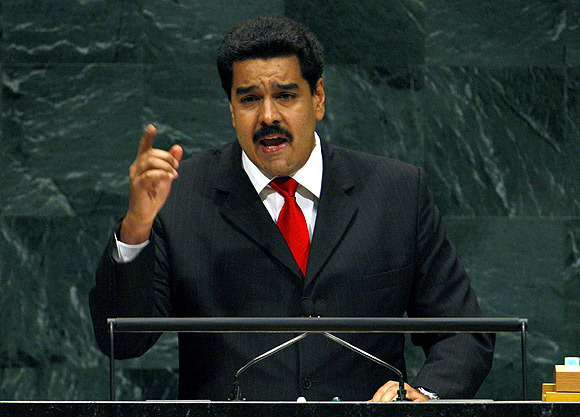 We present images of Venezuela's Vice President Nicolas Maduro. 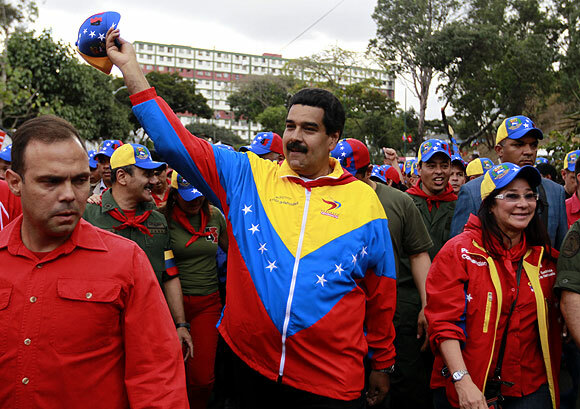 The country will hold a presidential election on April 14, officials said on Saturday, as acting President Maduro tries to benefit from an emotional outpouring for his late mentor, Hugo Chavez, and win his own term in office. 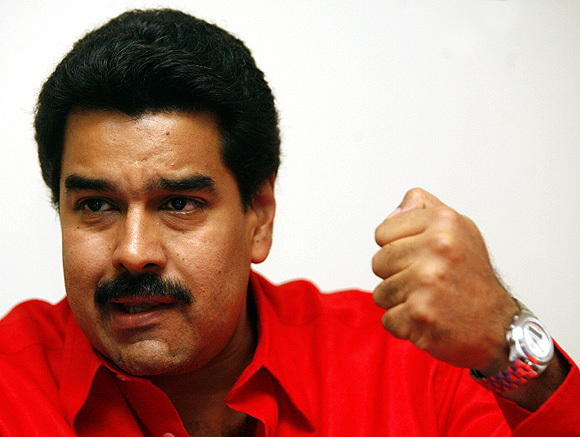 Maduro, a physically imposing former union leader who served as foreign minister and vice president under Chavez, has vowed to keep the late leader's self-styled socialist revolution alive. 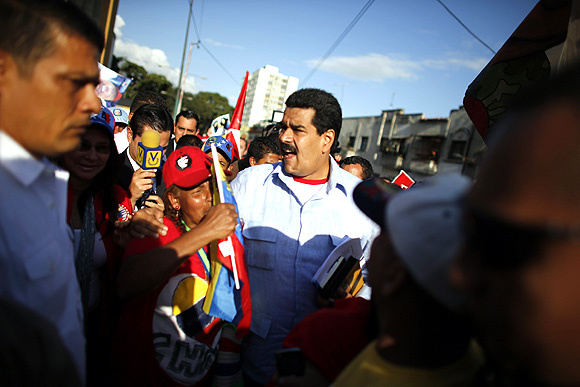 Venezuela's Foreign Minister Nicolas Maduro speaks during a meeting in Tiquipaya, on the outskirts of Cochabamba. Madurao is part of Venezuela's President Hugo Chavez delegation during Chavez's tour of Argentina, Uruguay, Bolivia and Colombia. 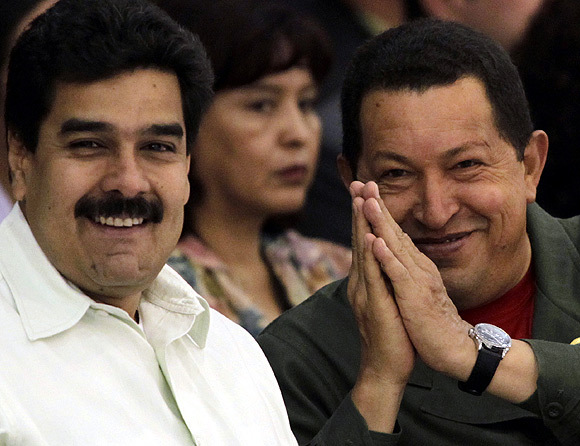 File photo shows Venezuela's late President Hugo Chavez gesturing next to then Foreign Minister Nicolas Maduro at the World People's Conference on Climate Change and the Rights of Mother Earth in Tiquipaya on the outskirts of Cochabamba. 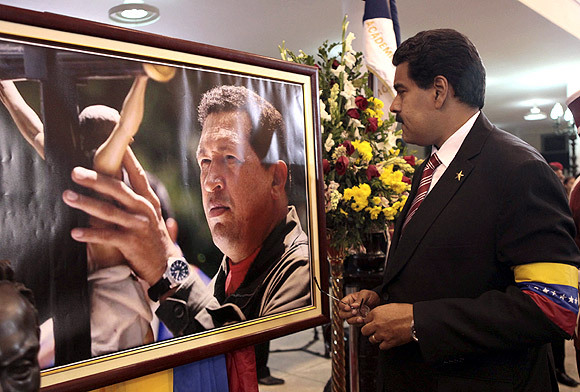 Acting Venezuelan President Nicolas Maduro looks at a photograph of late Venezuelan President Hugo Chavez during the funeral at the military academy in Caracas in this picture provided by Miraflores Palace on March 8, 2013. 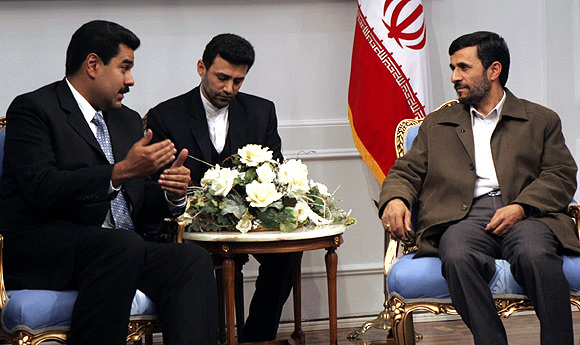 Iranian President Mahmoud Ahmadinejad meets with Maduro in Tehran March 6, 2007. 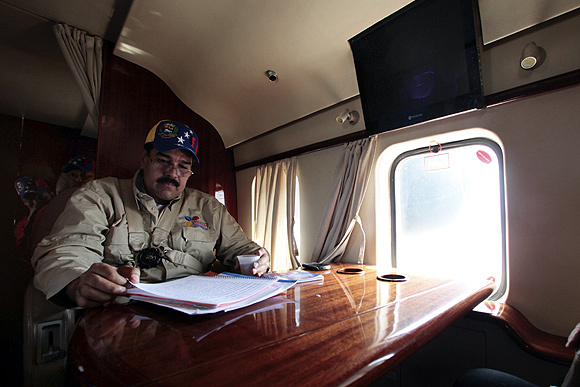 Maduro reads a document as he travels in an helicopter during a visit to the western state of Zulia in this photo provided by Miraflores Palace. Maduro greets supporters next to his wife Cilia Flores during a parade to commemorate the 21st anniversary of President Hugo Chavez's attempted coup d'etat in Caracas. 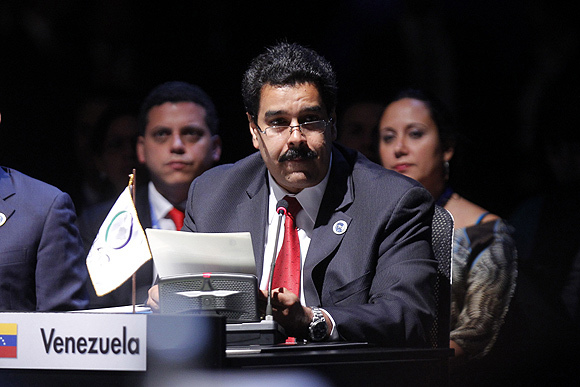 Maduro reads a letter from Chavez during a general meeting at the summit of the Community of Latin American and Caribbean States in Santiago. 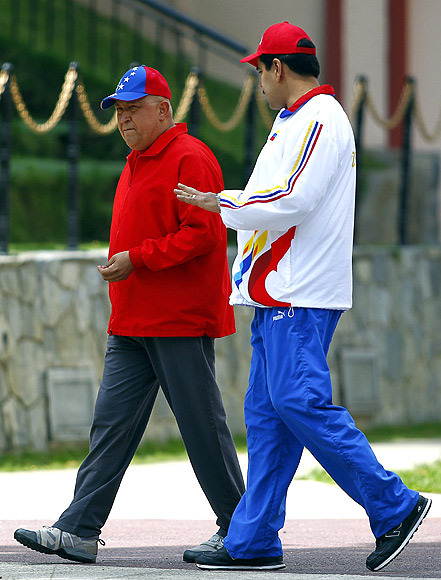 Chavez walks with Maduro before a news conference at Miraflores Palace in Caracas. Maduro addresses a news conference at Venezuela's embassy in Montevideo after a visit to Uruguay to participate in a meeting of South American trade bloc Mercosur, whose member countries are Argentina, Brazil, Paraguay, Venezuela and Uruguay. 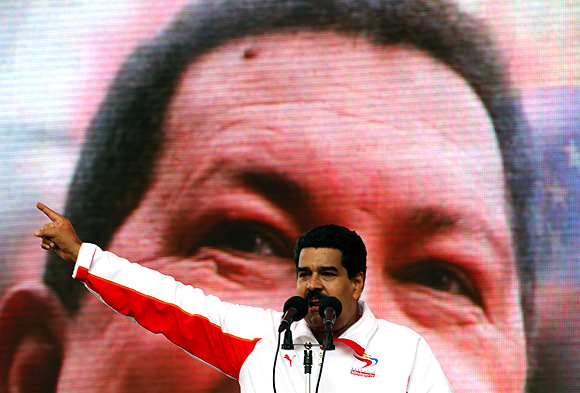 Maduro talks in front of a screen with an image of Venezuela's President Hugo Chavez during a rally to commemorate the 55th anniversary of the collapse of the last Venezuelan dictatorship of Marcos Perez Jimenez in Caracas. Jimenez was ousted after a popular uprising in 1958.